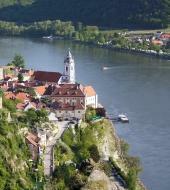 On sundays, the MS Admiral Tegetthoff, takes you from Vienna to Dürnstein in the Wachau valley. Enjoy the trip and the lovely view of the villages, meadows, and forests, along the river. There will be 2 hours' shore leave to spend in Dürnstein to discover the secrets of this picturesque village. Please be at the departure location at least 30mins before your designated departure time.